The Story: This is a reef usually only dived at night as it's not very deep and doesn't attract the big schools of fish and pelagic like the surrounding Komodo reefs. For five years working as the Video/Photo Pro on a boat that dived this reef week after week, it wasn't until my final months onboard that I started diving it. 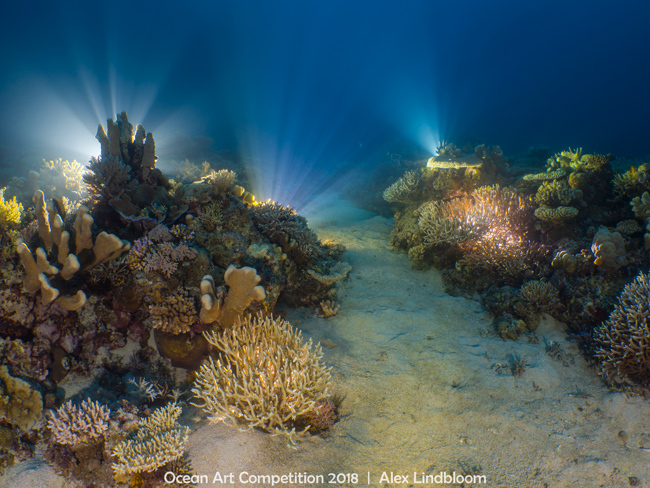 Though it lacks the fish life, the reefscape is stunning and I wanted to figure out a way to capture it in a way I had never photographed reefscapes before. As someone who loves long exposure night scenes on land, I wanted to try to emulate that underwater. On land you generally have enough ambient light to illuminate landscapes even at night, but underwater it's much much darker and a 30 second exposure and wide open aperture still won't do the trick. I ended up packing up all my old and new video lights I had collected over the years along with a very cheap plastic tripod and set out to find a suitable place to set up. In order to set up the lights and tripod and not damage the coral, I also needed some patches of sand which would also compliment the reefscape. Eventually I found this place which I came back to once a week for four weeks straight and would spend up to 90 minutes each dive in this one little area. It took me a long time figure out what power setting each light needed to be at, where each light needed to be placed, and also figure out how to paint the reef so that I got a nice even 'coat' without over saturating any one area with the light.